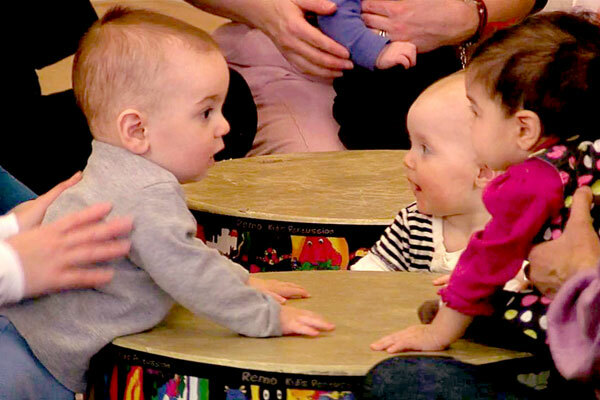 This offering just for infants is a one-semester introduction to Music Together. The musical activities and materials are especially designed for parents who want to learn as much as possible about music development in infants. Meet other parents of newborns and have fun! As a parent, you pay attention to every move your baby makes. Have you noticed their eyes light up when they hear a song? Do they start cooing and wiggling when you sing a nursery rhyme? Chances are you’ve seen glimpses of the music-maker inside—now it’s up to you to bring it out to the fullest! When you sing in the car or dance in the living room, you are setting the model for your baby, who is listening and observing as you play with music. With Music Together, you can learn lots of musical ways to interact and bond with your new baby, supporting their development in these important early years. Read more about how Music Together supports your baby’s brain development (PDF) and the parent-child relationship (PDF). Since babies are musical beings even before birth, it’s never too early to get started—even newborns are amazingly oriented to become music-makers. Because they begin to hear and respond to sound in the womb, most babies’ sense of hearing is well developed at birth, and they are already alert to musical sounds—especially the voice of a parent singing! Just as your baby is prepared to learn language, they are equally prepared to learn music.